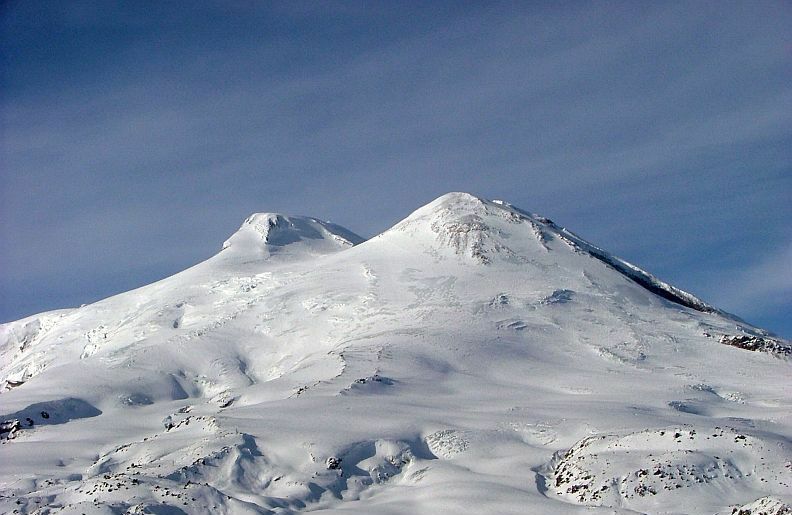 Mount Elbrus is the highest peak in Europe. It rises to a height above sea level of 18,510 feet (5642 m.). This mountain lies about 150 miles from Tiflis in the Georgian portion of southwestern Russia. The name Elbrus is a corruption of Alborz. The name Alborz comes from a legendary mountain in Persian mythology. The mountain was first climbed in 1874 by an English expedition, led by Florence Crauford Grove with his companions Frederick Gardner, Horace Walker, and Swiss climber Peter Knubel. It is a volcanic peak in the Central Caucasus, that has long been extinct. Twin cones rise at the summit: the highest is located west of the other, that is only about 60 feet shorter. The summit is capped in ice year round, and over 20 glaciers descend the slopes. All told, the mountain and its vast glaciers cover 56 square miles. From a mountaineer's point of view, it is a basic snow and ice climb and the best months for attempting it are June, July, August, and September. The summit provides incredible views of the entire Caucasus.